Admissions Open for Aspire India Scholars Program 2019. The Aspire India Scholars Programme (AISP) is conducted by the International Institute for Higher Education Research & Capacity Building (IIHEd) at JGU. This is a Summer School designed for Indian high school students to guide their transition from high school to higher education. During the two-week intensive residential programme, the students engage in experiential learning about eight interdisciplinary modules through lectures and workshop sessions. For AISP (For Indian students), the students who are currently enrolled in class 9, 10, 11, and 12 in any school in India are eligible to apply. Just follow the below steps to apply for the Aspire India Scholars Programme (AISP) 2019. 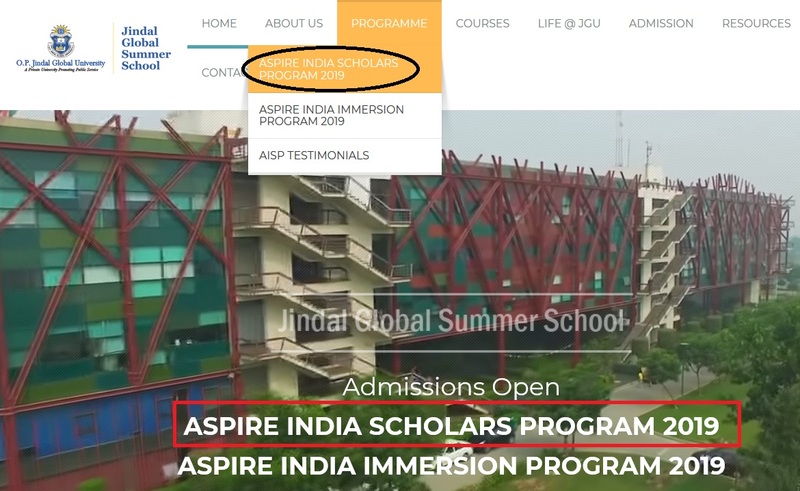 Step 1 : Go to the official website of Jindal Global Summer School through provided above. Step 2 : Next Read the instructions carefully and click on “Online Application Form” button. 1. Create your account : Your Jindal Global Summer School account will allow you to start, save and continue your application online, at your convenience. 2. Open the Verification email : To confirm your email address and to start your application process. 3. Start your application : Once logged in to your JGSS account, you can start your application process. Read the detailed guidelines given below. Applications received after the priority deadline of April 26, 2019 will be considered on a rolling basis. Hence, we will continue to review applications if any seats are still available. 1. How can I make the Payment for Aspire India Scholars Programme? For AISP, payment can also be made through credit card, debit card, or internet banking through CC Avenue Payment Gateway. 2. Are there any special language requirements for studying in AISP? Since the academic modules are taught in English, your English should be proficient. 3. What activities can a student indulge in during the AISP Jindal Global Summer School? AISP Students have the opportunity to participate in a number and a good variety of academic, cultural and sports activities on campus. Students will experience a healthy and robust cultural life on campus and will have the opportunity to improve their skills in games and sports via practice sessions supervised by professional coaches at the University. 4. I am a returning student who attended Aspire India Scholars Programme (AISP) last summer. Do I have to apply again? Returning applicants, need to re-apply for attending the AISP. Please contact our office at aisp [AT] jgu.edu.in if you are a returning student. 5. When do I get an AISP ID? Students will receive an AISP ID only after they have been confirmed into the program. Please continue to be patient as our office staff works as quickly as possible to process AISP IDs for the students. 6. What certificate do I gain by completing Aspire India Scholars Programme? Your certificate will be issued by O.P. Jindal Global University and will state your name and course dates; it will be signed by the Vice Chancellor and the Registrar of the University. You will receive the certificate during the graduation day ceremony on your last day of AISP.